Do you remember the penguin pants? I didn't know if I wanted a penguin shape made out of penguin fabric. I ended up just doing it although I should have doubled the white fabric so you can't see through it. It works, though. I also had to make cherries for the cherry pants daughter--she didn't want to be left out. Then, I ended up making another pair of pj's for the cherry pants girl. So, I appliqued an owl on that one to go with the owl pants. I thought you might like to learn a few tricks. Applique is one of those things that looks harder than it is--especially this kind. The best part is that you can buy something already made and add to it. There is a great deal of satisfaction and not quite as much work as making a whole outfit. 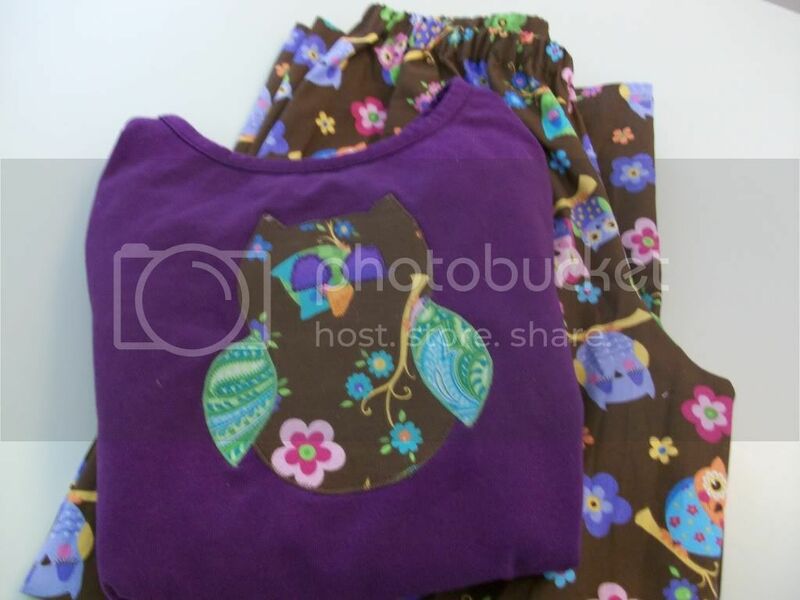 It's easy to find inexpensive t-shirts and just embellish with applique to make them really fun. I find applique easy but time consuming. And, it doesn't hurt to practice a few times on a scrap before you get started--even if you are a pro at this. The practice piece gives you a chance to set your stitch width and length and get it right before you start sewing on your applique. eHow has a great tutorial for how to applique. You can find it here. Another trick I have learned is for hems. I really do not like to hem things, but I don't like the way it looks when I use a quick and easy method such as leaving a serged edge. I have discovered that the part I don't like is manipulating the fabric when it is in a tube rather than when I can lay it flat. So here is a trick for you. This only works when you aren't going to change the hem length. I almost always use it on sleeves and when I am making multiple items that have the same length (all of the pj pants for one daughter, for instance) and I know exactly what the length will be. Sorry I don't have any pictures--I think this makes sense, but if it is still confusing, I can go back and add pictures! Before you sew the seam to make the sleeve or pants leg or sew front and back pieces together for skirts, serge or stitch around the bottom edge. I generally serge it because it is easier to turn than just a stitching line. (Set your stitch width at 1/4 inch.) After you have serged the edge, fold it to the inside and iron it flat. Then, fold up the remainder of your hem and iron it flat. Now, go back and sew the seams being certain that the ironed hem is opened out while you do this. After the seam is sewn, fold your hem back up and iron flat again and stitch it. It is easy to fold up now because it was already ironed in place. You may have to redo the edges right by your seam--they tend to flatten a little more, but, again, it is really easy when the rest of it is in place already. I love this method and I don't have to work with little tiny "tubes." Hope it helps! 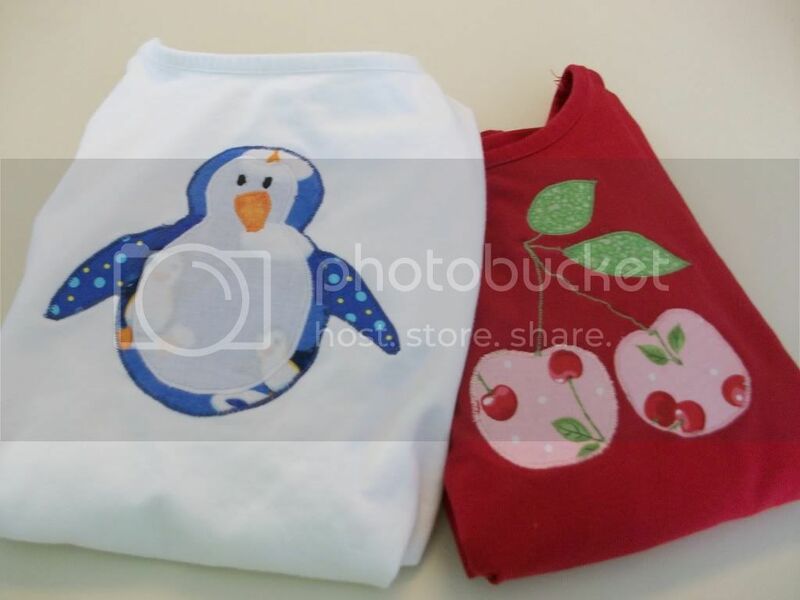 Cute penquin and cherries! Way cute tammy! I like it.